CMG is excited to partner once again with McDonald’s and the GSW Region to manage conversions of 100 locations in the Dallas, Oklahoma, Albuquerque area. All to be completed in 2017. In a continued partnership with lululemon athletica, CMG assists with its second “Local” location. This time, a men’s store in Toronto’s historic Ossington Avenue. Lululemon opens its newest store in Santa Rosa Beach, Florida, on the famous Highway 30A, a popular vacation destination. 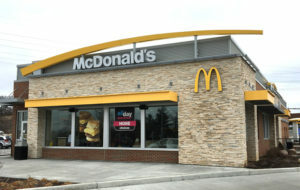 CMG completes two more Major Remodels for McDonalds. The new projects in Fayetteville, AR and Fort Smith, AR included significant interior and exterior renovations creating a fresh and modern look. We are proud to announce the new opening on Feb 2nd of the newest lululemon location in Greenville, SC. The new store resides within a newly developed multi store/tenant building in downtown business district of Historic Greenville. CMG completes another Taco Bell re-image in Richmond, VA.
CMG continues its partnership with Taco Bell and is excited to complete its recent renovation in Richmond, VA. The project, a full exterior re-image, included an interior renovation allowing for increased kitchen capacity. CMG is proud to announce the newest renovation on Madison Avenue (and 85th) street in New York City. An existing store, a temporary space was utilized during construction allowing for a full renovation including an update and upgrade to both fixtures and finishes, creating a upscale and modern look to its customer base. CMG works with the Heartland Region to renovate the Quincy, IL McDonald’s, including updates to the exterior of the building and interior renovation with new restrooms, upgraded kitchen and expanded dining area. CMG assists with an exciting new “Local” concept in Philadelphia. This site, residing in the hip Fishtown area featured a small and quick renovation/buildout.